The students began bouncing up and down on one leg, an exercise geared to improve their ankle, knee, and hip stability. This is the sort of strength training and injury prevention class that has been missing at the athletic center, said Director of Athletics Mark Conroy. While coaches do a very good job of instructing students, Conroy said what has been lacking is a consistent approach to strength training, injury prevention, and nutrition that targets students and teams at all levels. Conroy first heard about Conca Sport after Bridget Instrum ’12 trained with the West Springfield studio. In December, Instrum signed a letter of intent to play lacrosse at The Ohio State University. Her father, Dr. Khalid “Kelly” Instrum—an orthopedic surgeon who has worked with Williston athletes—also recommended Conca. Last year, Conroy decided to bring the trainers to Williston Northampton for a pilot program. 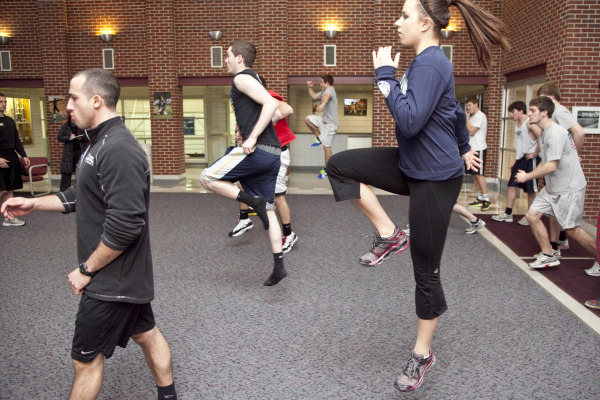 Over the winter, Conca has been working with students in the fitness program. He’ll return to work with four teams for a couple of days each week during the spring. If the initial trial is successful, Conroy hopes to eventually offer such training on a daily basis to all Williston students, from dancers to varsity football stars, to help them establish healthy habits. For the pilot, Conca and his team of trainers worked with off-season athletes on three main components: muscle activation and warming up, weight training, and metabolic conditioning. “This is what they have to do to get ahead of the competition,” Conca said as Adam Curtis, a lanky senior in plaid pants, in walked up. “I wonder if I should be doing sit ups—or if you have any idea what a pole vaulter should do?” he said. “No, not sit ups,” replied Conca. 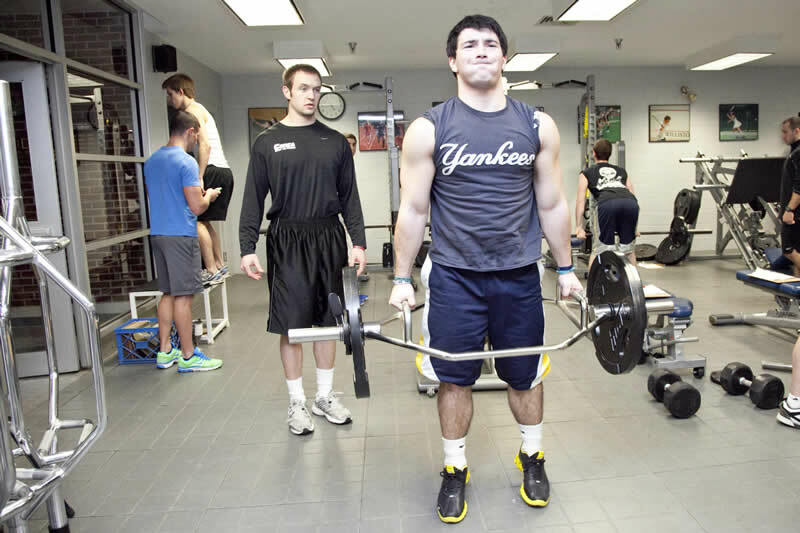 That caught the attention of seniors Max Reichelt, Alex Nunnelly, and Alex Doudnikoff, who were working out nearby as part of a separate class. “What’s wrong with sit ups?” Reichelt asked, jumping up. A better workout, Conca explained, would include plank pyramids and exercises that targeted the inner muscles along the stomach and back. 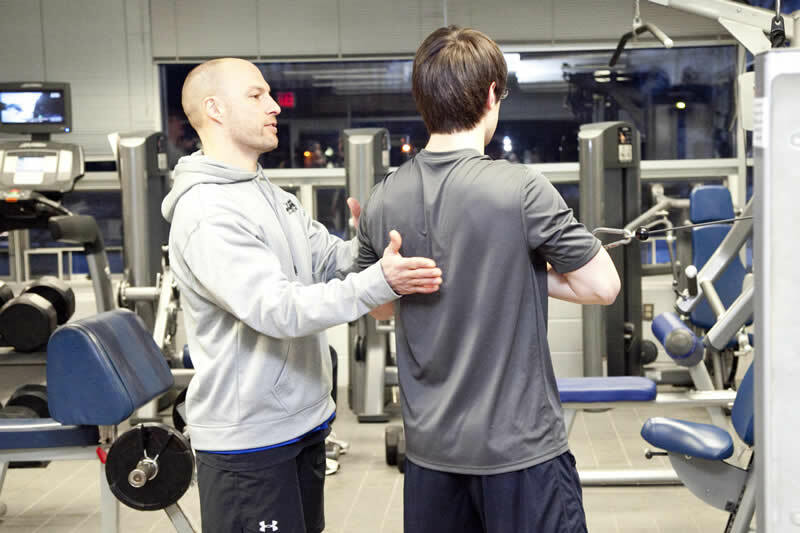 “I want to erase the myths and misconceptions about what athletic training really is,” Conca said as the students headed back to their workouts—Curtis to the weight room and his classmates to their stretching.